Google calls it Instant Preview for Mobile Search, but it's actually a new interface based on Google Fast Flip that lets you preview search results. "Starting today, Google Instant Previews is available on mobile for Android (2.2+) and iOS (4.0+) devices across 38 languages. Similar to the desktop version of Instant Previews, you can visually compare search results from webpage snapshots, making it easier to choose the right result faster, especially when you have an idea of the content you'd like to see," explains Google. Google replaced the stars that allowed you to bookmark results with the new zoom icons for Instant Preview. 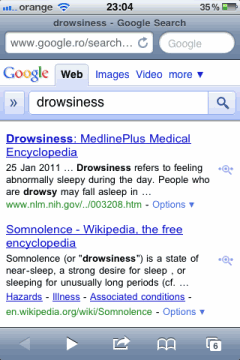 If you click on a zoom icon, you'll see a completely new interface that lets you preview one search result at a time. 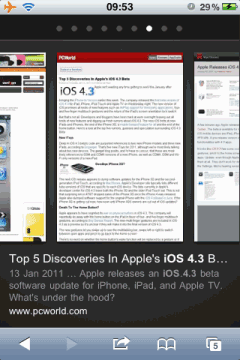 It's interesting to see that Google's screenshots show the mobile versions of the web pages. Fantastic! But sometimes the preview pages are a little slow to load. I want the star icon back, how do I get that back?